WordPress is limited to preview changes in posts and pages. What if you want to preview a different theme with additional changes or completely re-make your website? Doing all this on a live WordPress site may be inconvenient for your visitors. This tutorial shows you how to create a staging environment for your WordPress site and develop it without affecting the live version. Copy all the files from the existing WordPress installation to a newly created subdomain. In this case files will be moved from public_html/ to public_html/staging/. Refer to a tutorial on managing files via File Manager for more information. You can use phpMyAdmin to create a copy the database as shown in this tutorial. However, this option may not be available on some hosting providers. You can create database backup file and then import it to newly created database. add a privileged user to a database. IMPORTANT: Change subdomain to your newly created staging subdomain and domain to your original WordPress domain. The staging environment is now ready for use. 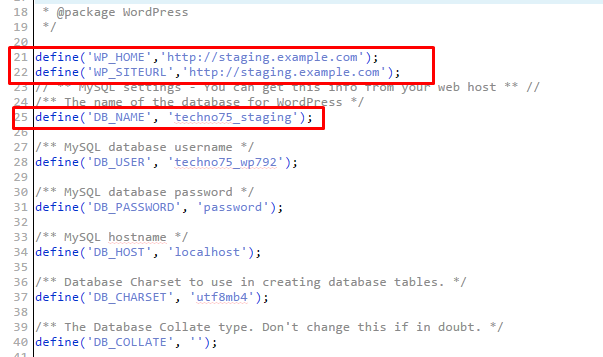 To apply all the changes you have made to your staging copy of WordPress you need to copy the staging database back to the original one and do the same with all the files from the staging subdomain. You have learned how to quickly create a staging environment for a WordPress site. You can also password protect the staging copy if you don’t want others to access it. Linas started as a customer success agent and is now a full-stack web developer at Hostinger. He is passionate about making a positive impact on people by utilizing user-driven development techniques. As much as he enjoys coding and changing the world, he secretly dreams of becoming a rock star.